Delta adds those nasty fuel surcharges (masks them as carrier ones) for tickets issued ex-Europe so this offer only makes sense for travel from the US. You should check the paid fares as well that may be exceptionally low and using miles may not make sense for economy. Award Tickets between the continental U.S. 48 and London on Delta and Virgin Atlantic. Award Tickets shown are round-trip. Tickets | Tickets must be purchased on or before January 10, 2019 at delta.com. Travel Period | Travel may begin on or after February 1, 2019 and all travel must be completed by April 30, 2019. Award Travel | Award Travel is subject to government-imposed taxes and fees and carrier-imposed charges, which are the responsibility of the passenger and must be paid at the time the ticket is booked. 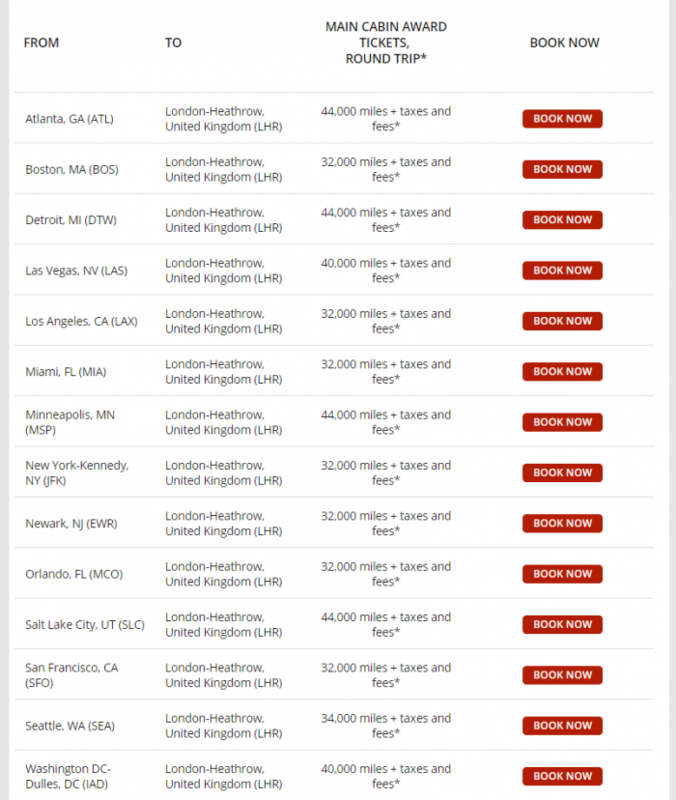 Taxes/fees/carrier-imposed charges depend upon the itinerary, and will range between $142 and $185 round-trip Main Cabin travel between the contiguous 48 United States and London (DL-operated). Award Seats are limited and may not be available on all flights or in all markets. Cancellations/Refunds/Changes | Tickets are nonrefundable except in accordance with Delta’s cancellation policy. Fees may apply for downgrades/reissues and itinerary changes. Contact a Delta agent or see Award Travel Rules for details. Award Ticket changes must be made at least 72 hours prior to the departure time of the flight being changed. Award Tickets booked within 72 hours of departure are nonrefundable and cannot be redeposited or reissued unless prohibited by local law or within the risk-free cancellation period. No changes will be permitted to the originating flight of Award Tickets booked within 72 hours, however changes to the return are permitted if the return flight is not within 72 hours and the change is made at least 72 hours prior to flight departure. Fees apply for any changes. Taxes and fees will apply. Voluntary changes to Award Tickets after promotion has ended may result in an increase in mileage costs. SkyMiles Life | By tagging photos using #SkyMilesLife, user grants Delta Air Lines (and those they authorize) a royalty-free, world-wide, perpetual, non-exclusive license to publicly display, distribute, reproduce and create derivative works of the submissions (“Submissions”), in whole or in part, in any media now existing or later developed, for any purpose, including, but not limited to, advertising and promotion on Delta websites, commercial products and any other Delta channels, including but not limited to #SkyMilesLife publications. Delta reserves the right to use or not use content tagged #SkyMilesLife, and user will not be entitled to compensation if photo is used. User warrants and represents: (a) he/she is the sole and exclusive owner of the Submission, including all rights therein, and that the user has the full and exclusive right, power and authority to submit the Submission and to grant Delta the rights to the Submission, including but not limited to the worldwide copyright; (b) the Submission does not infringe on the rights of any other person, firm, corporation or entity; and (c) no rights in the Submission have been previously granted to any person, firm, corporation or other entity. Delta reserves the right in its sole discretion to remove any Submission at any time. By tagging photos using #SkyMilesLife, user agrees to indemnify and hold Delta harmless from and against any and all third-party losses, demands, damages, rights, claims, actions and liabilities of any kind arising out of or related to any claims of infringement or violation of privacy or publicity rights related to Delta’s use of the Submission submitted to Delta in connection with the campaign. See full terms at delta.com/skymileslife. Taxes | Taxes shown are based on nonstop flights and accurate as of January 7, 2019. Changes in currency exchange rates or government-imposed fees may cause taxes to fluctuate. International travel taxes and fees may vary depending on departure airport. Baggage Charges | For travel between United States and Europe, 100 USD or 65 GBP1 fee for second checked bag. Allowances subject to size/weight limits. Contact a Delta agent or see Excess Baggage for details. Visit virginatlantic.com for Baggage rules on Virgin Atlantic flights. 1GBP amounts will be charged when exiting Great Britain, respectively.